that will allow 'relaxed' placement, and not impede the citizens. - Single menu button, F-key variants of straight 1-wide piece, corners and angles. be used along shoreline and not be floating. - Angle piece and Straight-to-Angle pieces, F-key for variations. - Town Stone Ends added into matching Town Stone Walls menu's. - Added more variations, via F-key. - Added to 1x1, F-key variant. - Added to 1x1, F-key variants. how bout a new pond/lake. can it remove the ground so it looks like it sits down in.and not have to have the piles of rocks around it like RED'S NMT fish pond?better yet make it so its a off shape not a perfect circle. next an old tire swing. tree fort has been mentioned by others. a field meadow road/squares that have wildflowers n grass texture. and if u really wanta get overly creative a set of walls that can b places tight up against buildings. say u like a storage barn set but u dont want them all to b the same style u could add the walls against the barn n then your town looks like it has different style barns. i know i'll quit with the crazy ideas. lol. u guys all do good work,n i do realize it aint easy stuff at all. Thanks for the update. It worked fine in my saved game. that is an interesting idea, once I learn how to make things as ghost decorations, I might try something like that. It would require a fair amount of playing around to make them sit right, and would only be suitable for some buildings, but it is interesting... it reminds me of another game I've played, but I can't think what one. Your other ideas are also very good, thanks. I will return to it, but not right now. After I update a few other things. Do you have ideas? or problems? I'm thinking of bulking up the menu, instead of so many f-key variants - all this f-keying is tiresome! Adjustments to some of the textures to look better in the game. Also give all fence all the same options. 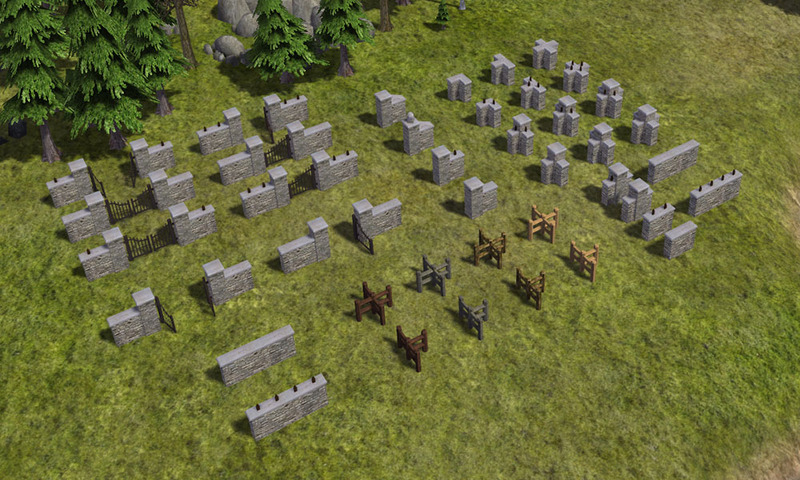 I've also got a few fences I built for the DS Small Village Cemetery but didn't make it, which I'll also include. All I miss at the moment is a T piece for the log fences. Hello Discrepancy, would it be possible to have the walls and entrance around the Goods Market in the DS Small Village mod as fences also? Thank You for this fantastic mod. Love the mod, add's a great variation to the game. One thing I am missing from it is diagonal pieces in the simple log fence, you have the angle corner but a full diagonal piece would be great! DS do these fences work like ghost decorations? can they b placed onto a pasture or must they b placed outside the pasture??? No they aren't ghost pieces, I'm not sure yet how to do the code for ghost pieces. Some of them are road buildable though. is this going to be updated for banished 1.07 so that this mod will show up in the mod collection toolbar instead of the town services menu? it's not a disaster if it isn't but I was wondering , because all of your other mods are in the mod collection toolbar. also dsroads isn't in the mod collection toolbar, but that makes sense that it shows up under the roads and bridges section.